Yona came to us from Sweden, at the age of 10 weeks. 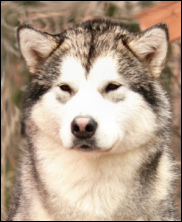 Yona is our third malamute and she is from kennel Cahppes. Her official name is Cahppes Miss Qrendi. Her calling name Yona means Gray bear in Cherokee indian language. Decicision to get Yona built up slowly and when I was following different breeding plans in Finland and also abroad, I saw very interesting combination at kennel Cahppes website. Both parents have Storm Kloud-lines in their pedigree and combination had many positive sides also thinking about possible future breeding. Yona's sire is BIS BISS AM/CAN CH. Sno Quest's King Of Landwood and dam SE CH Silent Ridge Bacardi-Breeze. Yona is extremely energetic and happy, maybe even a "grazy girl", which tail don't stop wagging. Even when she was microchipped, her tail wag... Yona is brave and open, social, happy and she just LOVES all the people. She can be also stubborn when she wants to, but usually she is very humble towards people. Yona loves speed and she runs and actually flies just for her own fun. Yona has proven to be very active, energetic and strong worker, who keeps our team speed up. Yona is mostly pair lead in our team, but she can also work in single lead. Yona has good structure; beautiful head and neck, good coat, good topline, good angulations, proportions and strength of her body. Correct bite. She has middle strong bones. Yona is typical mover. Yona has been checked healthy by her eyes, hips and elbows. Yona has also been dna-tested for long coat gene and she is N/N, normal coated, not carrier. Yona has official working results REK1 and REK2 from sled dog races. Yona has REK3-result from Ruunaa Race MD4 in March 2016. Distance was 3 x 32,5 km = 97,5 km. She has also ran Eastpoint Open 100 km (dimished to 75 km because of trail conditions) race in 6-dog class in Feb 2016. 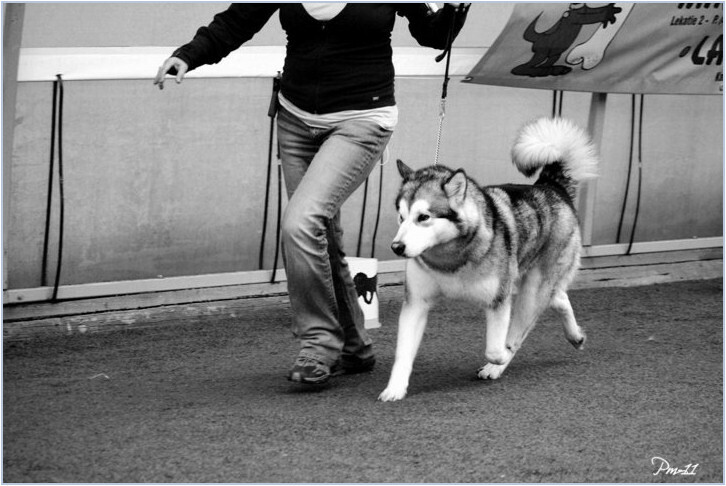 Yona has also accomplished Alaskan malamutes official Weight pull test by first try, gaining official result KVK1. In Finnish Alaskan malamute Clubs year 2010 Best-competition Yona was placed 12/20 in Best Activity-malamute class and 14/20 in Best Sled dog- class. In weight pull, Yona's best result in 2012 at Alma's Winter meeting is 460 kg / 17,36 x own weight, placement 4. in total competition and 3rd best female. In weight pull (cart) she has pulled 924 kg / 35 times her own weight. 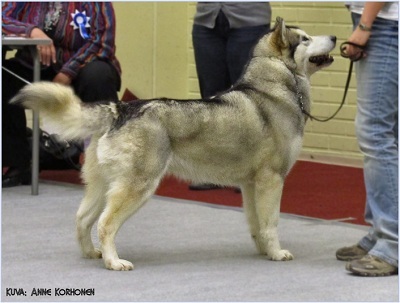 From shows Yona has Nordic Junior Winner-09 title and she is Finnish Champion. In malamute Specialty show 2011 Yona was female's class winner in working class. Thank you Anci and Henrik very much to get this lovely girl to be part of our family!